Sunshine and clouds mixed. High 63F. 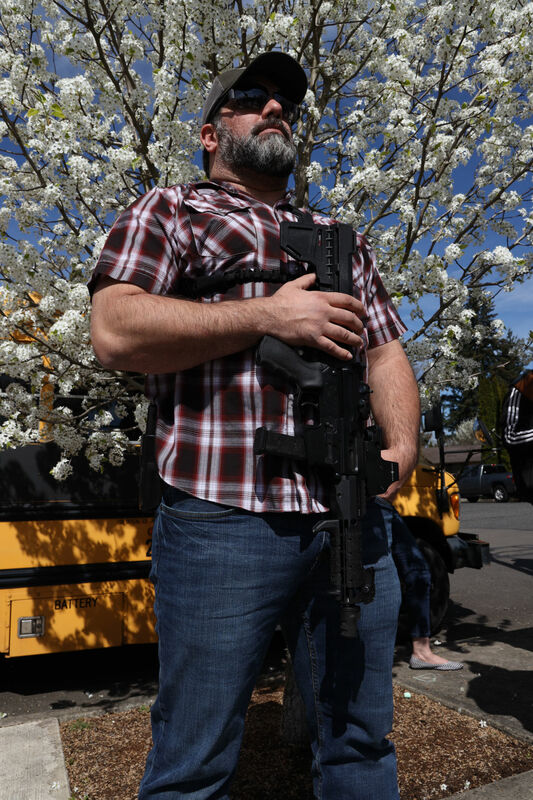 Winds NW at 10 to 15 mph..
Roy Goslar from Vancouver holds his rifle during a pro-gun rally at Kiwanis Park in Battle Ground, March 31. Patriot Prayer founder Joey Gibson gives a speech at Kiwanis park March 31. Gibson believes Battle Ground is home to some of Clark County’s most passionate gun owners. Fashioned with a sidearm, a gun advocate carries the American flag at Kiwanis Park in Battle Ground March 31. A series of demonstrations in Battle Ground came to a close March 31 as more than 100 gathered at Kiwanis Park to pressure the city to take a stand against Washington’s latest gun-control law, I-1639. The rally Sunday was the culmination of a series of similar events hosted weekly in Battle Ground by right-wing group Patriot Prayer. The demonstrations were part of a larger effort by the Vancouver-based group and other like-minded activist organizations to get local municipalities to create “sanctuary ordinances” which they believe would affirm Constitutional rights to bear arms in the face of I-1639. Among other things, the initiative changes state law regarding sale and ownership of semiautomatic rifles and passed with close to 60 percent approval in November. Several of those gathered for Sunday’s event were open-carrying firearms, be it handguns or the type of rifles subject under the new law. The final weekly demonstration received a challenge for a permit Patriot Prayer leader and former U.S. Senate candidate Joey Gibson applied for. The challenge received a ruling by Battle Ground City Manager Erin Erdman on March 29, affirming the permit’s issuance. The party which asked for Gibson’s permit to be revoked is called United BG Citizens. The appeal had a hearing on March 28 where both Gibson and members of United BG Citizens laid their cases. Gibson said he had submitted an application as a courtesy, noting for the previous demonstrations he did not and no action against the demonstrations were taken. United BG Citizens argued that due to the relative fast-tracking between application and issuance there wasn’t sufficient time for the city to make sure it had adequate resources for the event. Gibson’s speech contradicted this characterization, as he said he has focused on Battle Ground because its citizens “actually have the energy and (citizens) actually want” to demonstrate against gun control. “The Battle Ground police cannot be the enemy of you guys,” Gibson said. Previously, BGPD Chief Bob Richardson has said that unless the law changes and I-1639 is found to be unconstitutional in court, he is bound by oath to enforce it. Gibson argued that should city council approve an ordinance affirming that I-1639 was unconstitutional it would support the police by providing an official basis for not enforcing that law. Gibson brought up Rob Taylor to speak during the rally Sunday, an activist currently trying to get ordinances combatting gun control passed in Oregon. Taylor explained that unlike resolutions such as the one Cowlitz County passed in opposition to I-1639 in late January, an ordinance was more legally binding and carried penalties for those going against it. “If it wasn’t for armed citizens it would be a less civilized society,” Taylor remarked. Both Gibson and Taylor mentioned the Battle Ground City Council meeting the following day, urging those gathered to show up to put their support behind an ordinance push. Patriot Prayer had a similar coordinated effort at council’s March 4 meeting where many individuals, both city residents and not, testified in opposition of I-1639. You got the person wrong in which you named with the rifle. Just saying. Thank you for bringing this to our attention. A correction has been made. So why does the reporter refer to Patriot Prayer as a "right wing" group? Why not label them as a Pro 2nd Amendment Group? It appears that they report is biased because they felt the need to use "righ wing". I encourage reporters NOT to use words or phrases that serve no purpose but creating and signaling their person views.